In trading forex, we look first for the trend, which tells us what kinds of trades to make. But how do we know when to enter and when to exit trades? There is no sure answer to this question, but working with forex indicators helps us to find the answers. What is a forex indicator? Some of the most-used forex indicators are “oscillators,” that is a line on a graph moves from a limit to a floor and back again. There are also sentiment indicators which show which way traders are leaning; these use different types of market data as well as selected macroeconomic data. For example, The most simple of these shows how many traders of a given currency pair are going long and how many going short – if many more are long than are short, the sentiment is bullish and upward movement may be expected – and vice-versa for the majority going short. Momentum indicators (as the name indicates, it they gauge ‘force’ of price movements) use, for example, a formula compares the most recent closing price to a previous closing price from any time frame. The momentum indicator is usually displayed as a single line, on its own chart, separate from the price bars. All indicators use mathematical formulas, with calculations that range from Algebra 1 to higher mathematics. The good news is that you don’t have to make these calculations; y0u will find indicators in graphic formats right on your forex trading platform, and you can pull out the ones you prefer and keep them easily visible. Some are displayed in the form of lines on the charts. 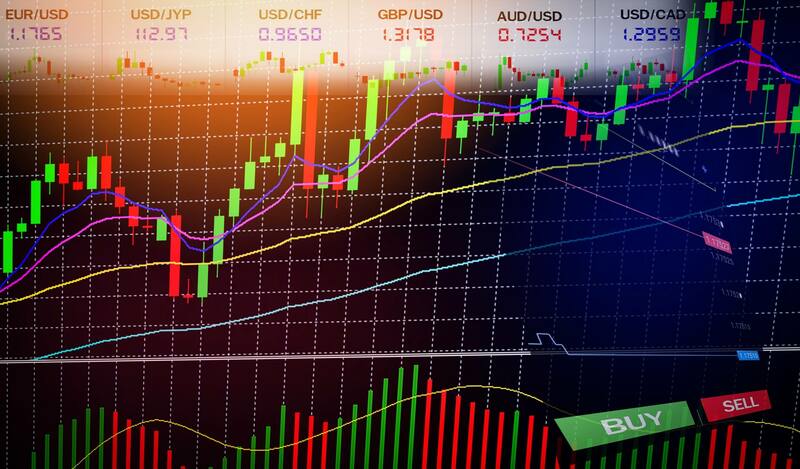 Possibly the most used forex indicator of all is moving averages – these have great weight in trading sentiment and automated trading invariably takes them into account – this is important, as the mass of money traded automatically can move markets, even in very liquid forex markets. The 30, 50 and 200-day moving averages are all much-observed trading signals. If you read forex trading analysis – and you should be reading it every day – you will hear frequent references to these moving averages. When a price moves higher than one of these moving averages, expect a further movement towards resistance levels. Ditto for when a price crosses in a downward movement – watch for the support floor. You will find a tool on your forex trading platform that indicates the moving averages you wish to see. This is an extremely popular oscillator, one that many professional traders use, although not by itself. If you’ve already determined a trend, and the RSI confirms it, you have a strong probability of success in your trade. The RSI is an oscillator that moves from one to 100. Close to 100 means a currency pair is overbought, close to one means oversold. Obviously, an oversold currency pair is likely to rebound, so, if you already think there is a rebound afoot, you’ve now got a good basis for a trade. The RSI has certain weaknesses, for example, if a price spikes repeatedly it tends to give bad signals. This is why you should never depend on it alone, but, in tandem, it is a very powerful tool. The Moving Average Convergence Divergence (MACD) is a very popular momentum indicator that shows the relationship between two moving averages of a currency pair’s price. A nine-day EMA of the MACD called the “signal line”, is then plotted on top of the MACD line. The signal line, also known as the trigger line, is created by taking a nine-period moving average of the MACD. Transaction signals are generated when the MACD line (usually the solid line) crosses through the signal line (nine-period EMA – usually the dotted line). Signal line crossovers are the most-used MACD signals. It makes bullish and bearish trends easier to spot. A bullish crossover, for example, occurs when the MACD turns up and crosses above the signal line. This indicator is less popular than the ones discussed previously, but it has been around since the 1960s and still has many fans. The On-Balance Volume Indicator is, as the name indicates, about volume – it works on the basis that prices will go up if there is a sufficient number of trades, which is what volume means. Here’s how it works: The idea is to enter trends that move in the direction of the OBV, and short those that do not. Whenever the trading price closes higher than the previous day, trading volume is added to a line. When the trading price is lower, it is subtracted from the line. If you see the price going up, and the OBV line confirms that movement, you know that there is a strong volume behind it – when it is weak, vice-versa. There are literally hundreds of indicators available on your forex trading platform, but these have withstood the test of time and are still popular. Try them, try a few others that you’ve read about, and choose the combination that works best for you.